In order to waken a sleeping child, the volume on an alarm clock is tripleUnder this new scenario, how much more energy will be striking the child’s ear drums each second? This is College Physics Answers with Shaun Dychko. 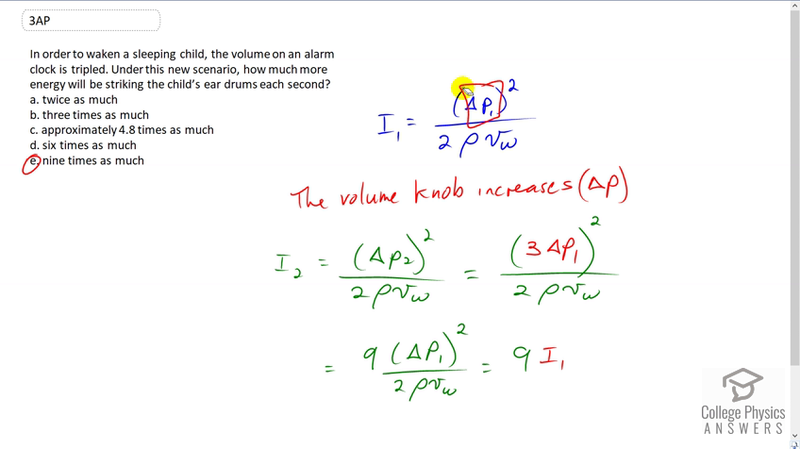 The volume on an alarm clock has tripled and the volume knob controls the pressure amplitude of the sound. And so intensity is the pressure amplitude squared over two times the density of air times the speed of sound in air. And when we have intensity two equaling this new pressure amplitude, we’re told that this new pressure amplitude is going to be three times the old pressure amplitude because it’s tripled. And this pressure amplitude is squared so we can write this as nine times pressure amplitude one squared, divided by two rho v w but this whole thing is I one and so we see that I two is nine times I one. So the answer is e.